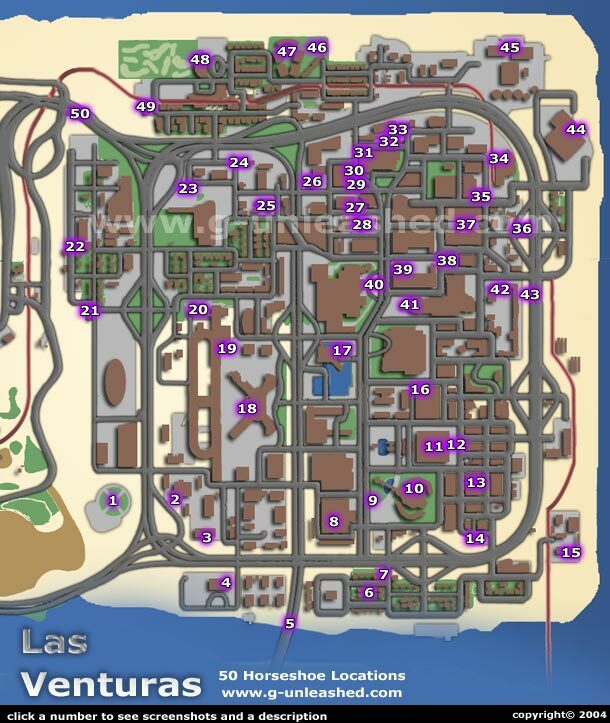 Here is the locations of all 50 Horseshoes in Las Venturas. If you have not completed the mission 'Green Goo' at the Verdant Meadow Aircraft Graveyard, then do not read this guide further as it will spoil something for you. You have been warned so if you go ahead and spoil it, dont come crying to me. I recommend writing down the number of each horseshoe as you find it and work in the number order of this guide. Check your stats regularly to see if you have the right amount of horseshoes. One more bit of advice, SAVE OFTEN! Collecting horeshoes gives you more luck everytime you get one. Getting all of them, will result in you having 1000 luck points and $100,000 in the bank. With this much luck, you will win more often when gambling. Click on a number to see 2 screenshots and a description to help you locate the Horseshoes. i own the ps2 version but i am unable to find number 37 does anyone know what the problem might be? I used the guides for the 'Gang Tags', 'Photos', 'Oysters' and 'Horsehoes. I found everything just fine. The only one I had trouble with was #14 on the Photo Ops because on mine, it was on the wrong side of the bridge support, not as shown here. Every other item was exactly where you said it was. For those having trouble, remember that in some instances, there are other buildings that look exactly like the ones shown in the pictures, maybe you are looking in wrong place. im missing 1 but i dnt no wht 1 it is nd ive wnt through all 50!! It's a lot more easier to spray tags than find horseshoes as if you have already sprayed a tag then you will know be seeing the tag. You don't need all the luck. Betting tip #101. You will need some money for this... Go play roulette. Bet on ONE 3-1 and stay there. first bet the lowest, like 10$. If you lose, double it. If you lose, double it and play again, and again untill you finally win. Then start again at $10. Keep doing this until your limit increases, then go to the next higher table. If you do lose everything, reset the game. I'm up to 2mil already, with only 40 horseshoes. I have got 41 horseshoes but number 2 isn't there. I've already checked. isthis a glitch? I went thru this and got all the horseshoes except the 50th one. I know for sure that I grabbed that horseshoe a few months ago while playing the game. so why doesn't it say that I grabbed it? it's puzzling me because i got every other one except that one. I also know that i grabbed a few others around the city. why aren't those ones on this map? I have a problem with number 20, that horseshoe is just NOT there!!! Can anyone please give me a hint how to find it? If anyone is tired of having troubles with things like horseshoe's then visit http://www.michaelsrpg.com/san_andreas/downloads.html it has my saved game from after the first storyline mission with a long list of completed goodies including all horseshoe's, oyster's, tag's & much more (no CHEATER label in stats).